If you are looking for a mailer that works, is not overdone, and has a great history of getting opened, the snap-pack mailer is for you. This is the most effective piece to hit the direct mail marketing scene in quite some time. 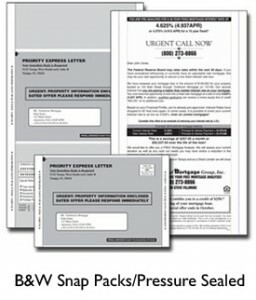 The snap-pack mailer is cost effective and response generating, a combination that can’t be beat. Snap-pack mailers are the official looking letters that requires the recipient to tear perforated stripes off of the sides in order to open it. This is the same secure format that banks use to mail PIN’s and retailers use to mail rebate checks. These mailers are perfect for financial service offers including: Mortgage Refinance, Tax Relief, Debt Relief Notices, Credit Bureau Mailers, and Loan Modifications, just to name a few. The snap-pack is designed to look “important”. The document may often contain urgent, time sensitive information or an attached check. A majority of people open these snap packs the moment that they set eyes on them because it does not look just another advertisement.